TAI's custom and standard product heat straps are integral hardware in research programs at universities across nation, and we are now the preferred supplier of CuTS® to dozens of the Top Aerospace Engineering, Applied Physics and Mechanical Engineering Departments across the Globe. If your experiment or program requires CuTS, we are happy to work with you and get you the hardware you need; in most cases, for less than your typical $5,000-$10,000 procurement ceiling placed on your department. Visit our "CuTS® for National Lab & University Program," page to learn more! Come back to this page every few months to see our latest CuTS University Success Stories! Neutrinos are fundamental particles that play key roles in the early universe, cosmology and astrophysics, and nuclear and particle physics. Despite their abundant numbers generated by the sun, nuclear reactors, cosmic rays and in the big bang, they remain difficult subjects to study due to the weakness of their interactions. In particular, the masses of the neutrinos remain unknown, and it is uncertain whether neutrinos are their own anti-particles. The Majorana Collaboration is an international effort with over 100 participants from 18 institutions in five countries, which is currently constructing the Majorana Demonstrator, an experiment that seeks to observe neutrinoless double-beta decay (0νββ), a decay mode of an atomic nucleus in which two neutrons convert to two protons and two electrons. This process has not been observed, and it is not known whether it exists. If this decay occurs, a fundamental symmetry of nature, lepton number, must be violated, the neutrino would be its own antiparticle, and the rate at which it occurs will be dependent upon the masses of the neutrinos. Current experimental lower limits for the half-life of 0νββ are in excess of 1025 years. This is an exceedingly long time, given that the universe is only 1010 years old! 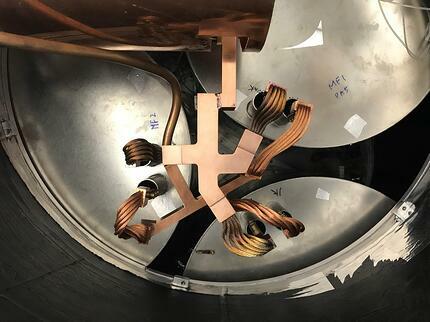 The Majorana Demonstrator will search for neutrinoless double-beta decay using a cryogenic array of germanium crystals enriched in 76Ge, an isotope which has the potential to undergo neutrinoless double beta decay. Germanium diodes are intrinsically pure detectors of radioactive decay, with excellent energy resolution. To reach new half-life sensitivities, great measures must be taken to eliminate background events that would mask a potential signal. 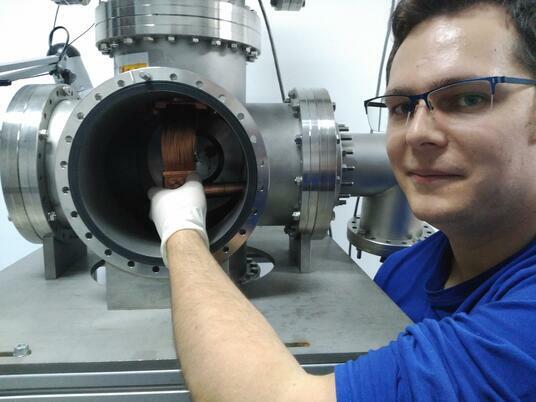 Materials used in detector construction must be of the highest possible purity, to limit radiation from impurities. The experiment will be housed inside of thick layers of copper and lead shielding, to eliminate penetrating radiation from external sources. To reduce background events generated by cosmic rays, the experiment is located nearly a mile underground, in the Sanford Underground Research Facility (SURF) in Lead, SD. 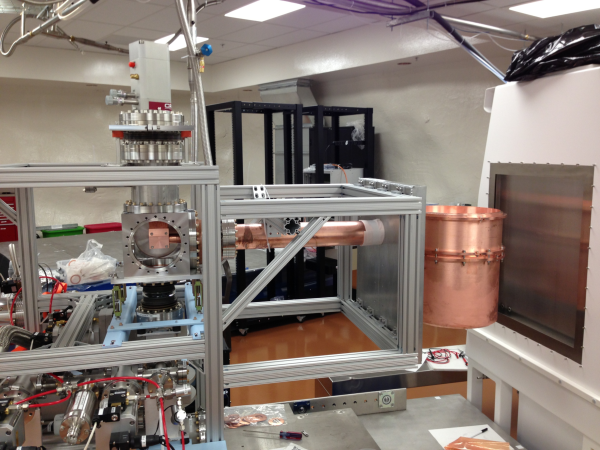 The Majorana Demonstrator is supported by the United States Department of Energy, Office of Nuclear Physics and the National Science Foundation, Particle Astrophysics program. 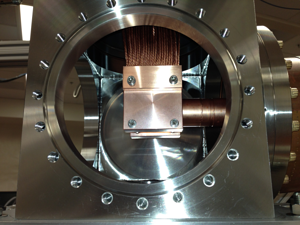 In order for the Germanium detectors in the Majorana Demonstrator to operated with optimum performance, they must be operated at near liquid nitrogen temperatures: 80 - 100K, in a vacuum environment. 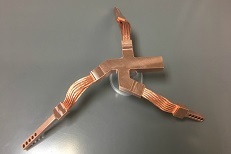 We are using copper thermal straps, designed and fabricated by Technology Applications Inc., as part of a cooling pathway between our array of Germanium detectors and a Pulse-Tube Cooler, which provides the cooling power. The straps performed perfectly, and there was no detectable degradtion of our vacuum performance using the OFHC Cu Braid under our vaccum conditions. We are very happy with the performance of the straps, the affordable price, and the high level of customer service and attention we received from their Marketing & Sales Department. In our department at Yale, we study superconducting circuits; specifically ones that can be used as quantum bits, or qubits. Qubits are the quantum equivalent of computer transistors and are the basic building block of a quantum computer. While these qubits have many possible physical implementations, we make them out of superconducting circuits consisting for a non-linear inductance made from a Josephson Junction and capacitance. The circuits are fabricated with Aluminium on sapphire and to work, need to be cooled to dilution refridgerator temperatures of about 10mK. This not only makes the devices superconducting but also makes these circuits behave quantum mechanically. We ordered the P6-501 and P7-501 thermal straps for use at the base stage of a cryogen-free dilution refrigerator. In our fridge, we mounted a second stage, which we call the mezzanine, for mounting samples off the mixing chamber plate. However, we noticed that the mezzanine was many milli-Kelvin warmer than our mixing chamber stage which was at 7mK. We installed 2 each of the P6-501 and P7-501 Cu thermal straps between the mixing chamber and mezzanine stage for improved thermal contact. The addition of these straps resulted in a noticeable drop in the temperature of the mezzanine plates from around 25mK to about 15mK. This dramatic improvement in the base temperature of our fridge and the excellent build quality of the straps means we will definitely be ordering more. The most remarkable aim envisaged at the University of Granada is to build a system to couple two ions stored in different Penning traps. 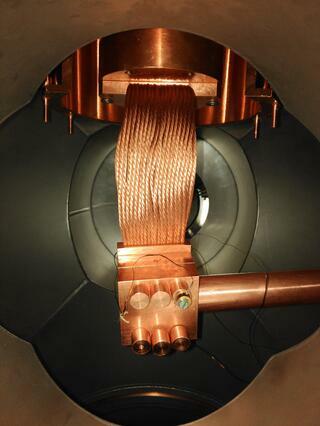 One of the ions is laser-cooled to millikelvin temperatures. The traps have a common electrode in order to make the electric charge induced by the ion flowing through between the traps, and have to run at cryogenic temperature in order to reduce the Johnson noise. A successful completion of this system will allow substituting electronic detection, by the detection of fluorescence photons and this will increase the sensitivity in mass spectrometry, which is important to perform measurements on superheavy elements produced in fusion-evaporation reactions at linear accelerators such at GSI-Darmstadt or to use the mass of specific nuclei for neutrino physics. We are building a shielding structure and we use thermal straps from Technology Applications to reach the temperatures of 4 K and 40 K at different parts of the shielding structure. 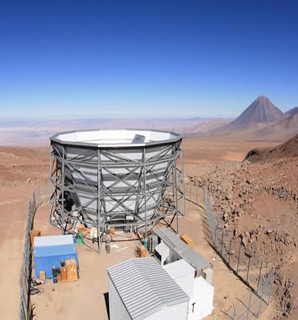 The Atacama Cosmology Telescope (ACT) is a 6 meter telescope located at 17,000 feet in the Andes Mountains of Northern Chile. Our collaboration consists of over 20 institutions and receives support from the National Science Foundation (NSF) and the National Aeronautics and Space Administration (NASA). Our primary goal is to study the Cosmic Microwave Background (CMB), millimeter wavelength radiation that was created about 300,000 years after the Big Bang making it the oldest light in the Universe. We detect this radiation using thousands of highly sensitive detectors that are kept under vacuum inside a large cryostat housed inside the telescope. We also cryogenically cool the detectors and optical elements to sub-Kelvin temperatures to increase the raw sensitivity. The elements inside the receiver are cooled using a dilution refrigerator (DR), which has 1 Kelvin and 100 milliKelvin stages. We need a way to connect these stages of the DR to the elements we wish to cool, which is where the thermal straps manufactured by Technology Applications come into play. 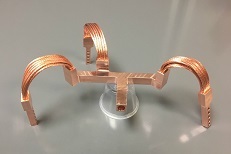 Using high purity, high conductivity copper, we attach the cold plates of the DR to the 1K and 100mK stages inside the cryostat optics tubes via copper to copper bolted mechanical joints. The thermal straps developed by TA act as an interface between the DR and copper rods that attach to the interior of the optics tubes. The photographs show the straps connected to the 1K stage and 100mK stage of the DR (right, 1K on top, 100mK on bottom) on one end and the straps connected to the optics tube interfacing rods (middle, 6 rods total with a 1K and 100mK rod for each of the three optics tubes) on the other end. 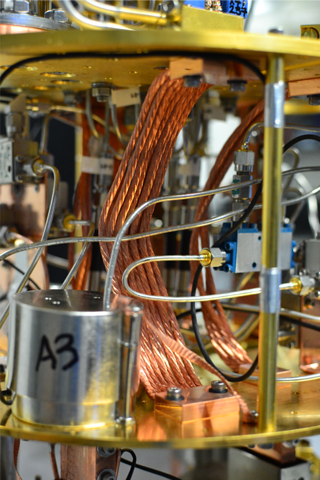 These connections allow our optics tube elements to be continuously cooled during regular observations of the CMB sky. The final product looked great, fit the specs, and was delivered on time. We've been cooling and running tests over the last several weeks and so far everything looks great...and (with TAI's straps and other modifications made), our detector arrays are running about 10mK colder than last season. This is awesome to see and tells us that the straps you produce are very applicable to what we do. We would definitely recommend your services to others!